Cunningham Falls State Park, located near Thurmont, Maryland, in the Catoctin Mountains, encompasses a beautiful 78-foot cascading waterfall, a 44-acre lake, campsites, playgrounds, picnic areas, and plentiful hiking trails. Located about 18 miles north of Frederick, the park includes the William Houck Area 3 miles west of Thurmont on Route 77 where you can find the lake, falls, and a campground. Head to the Manor Area 3 miles south of Thurmont off Route 15 to access the Scales and Tales Aviary, additional camping, and the historic Catoctin Iron Furnace, a landmark on the National Historic Register. Park Hours: Cunningham Falls State Park welcomes visitors from 8 a.m. until sunset from April through October, and from 10 a.m. until sunset from November through March. Camping: The William Houck Area Campground contains 106 basic sites, 33 sites with electric hook-up, nine four-person cabins, and four six-person cabins. The Manor Area Campground has 23 basic sites and eight sites with electric hook-up. Both areas remain open from April through October. (Camping is available year round in the Manor Area Campground, however, services are limited from November 1 through March 31.) Reservations are suggested. For details, visit reservations.dnr.state.md.us. Park Passes: Maryland Park Service Season Passports can be purchased at park headquarters or at the contact station at the park entrance. You can also purchase them online. Of Note: Cell phones are unreliable in the park due to spotty service throughout the Catoctin Mountains. Leashed pets are permitted in all day-use area, with the exception of on the sandy beach from Memorial Day to Labor Day. The main attraction at Cunningham Falls State Park is its namesake 78-foot cascading waterfall, the largest in the state. You can view the falls from a boardwalk or climb up the rocks on the right side of the falls. The easy out-and-back half-mile Lower Trail from the lake leads to the falls. The Boardwalk Trail provides access for wheelchairs. Swimming at the falls is prohibited. There are a variety of hiking trails at Cunningham Falls State Park ranging in distance and difficulty from easy half-mile strolls to more challenging 7.5-mile treks. The most strenuous, the combined Cat Rock/Bob's Hill trail, crosses the mountain and passes two scenic overlooks with a top elevation of 1,765 feet. It's not a loop trail, so you would need to either double the distance to return to your starting point or arrange for a pickup at the end. 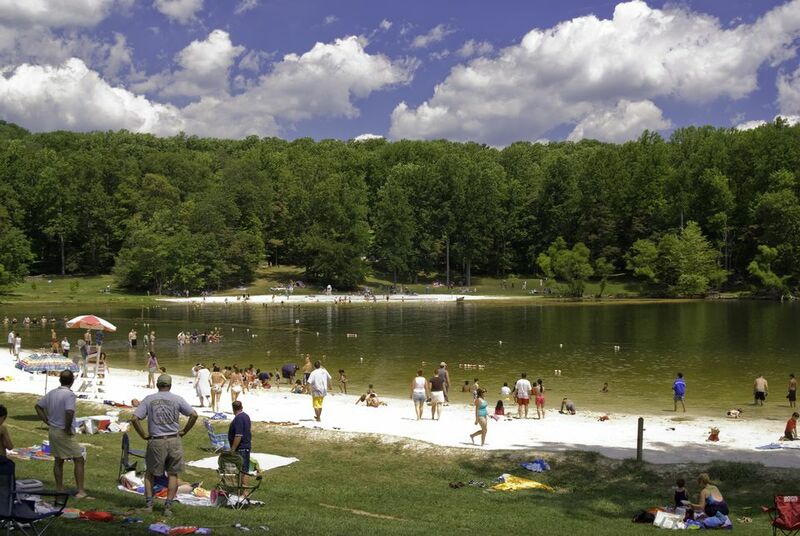 Cunningham Falls Park has a recreation area with a 44-acre lake, Hunting Creek Lake, for swimming, boating, and fishing. You can dip in the lake at three designated swimming areas between Memorial Day and Labor Day; lifeguards are on duty daily between 11 a.m. and 6 p.m. The narrow sandy strip at the lake's edge and the grassy slopes leading down to it fill quickly on summer weekends, so arrive early to stake a spot. Park staff turns away cars after they reach the daily visitor quota. You can rent boats at the boat dock at the lake at Cunningham Falls State Park during the Sumer months. Boaters with private crafts can launch for a small fee, but note that the park does not permit gasoline-powered motors on the lake. Best Places to See Fall Color Maryland, Virginia, and Washington, D.C. The Best Hiking Trails Around Washington, D.C.
Set Up An Affordable and Fun Date in Washington, D.C.